Welcome to my home page. Here's a disclaimer on the quality of this page (and really, this site in general). I've been a big fan of PhotoCDs for a while (well before I set up these pages) and now am a big fan of my Elph. In fact, putting photos up was one of the main reasons I finally got off my duff and set up these pages. I'm still getting organized, but there are a number of photos on the site. 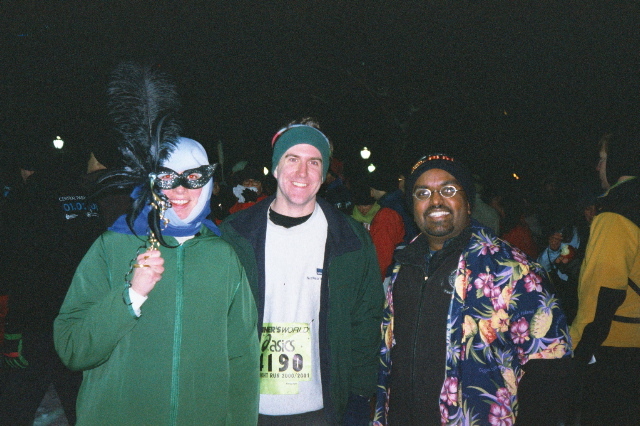 Here are Karen, Ken and myself at the 2000-2001 Midnight Run in Central Park. True to my prediction, those four miles were the longest distance I ran the whole year. I'll try to upload some pictures which actually have something to do with me soon, but I might have to learn table syntax first. First modified 14 September 2002. Check out my neighbors in R3.